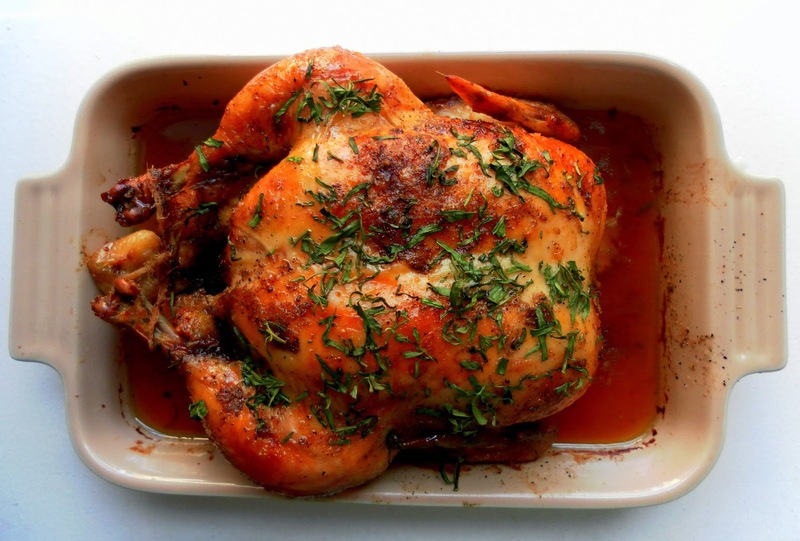 The first time I roasted a chicken was based on a recipe from my Hungarian mother-in-law. She has a traditional way of roasting the chicken. Looking back to the process, it is rather simple. My favourite roasted chicken was from the mobile vendor in Budapest, right next to the DVD rental store where we used to frequent. (Gosh, that was already some years ago since nowadays people don't rent DVDs anymore!) Anyway, the following is a recipe by Yummychunklet and she wrote it was adapted from Better Homes and Gardens. 1. Preheat oven to 375 degrees. Rinse chicken cavity; pat dry with paper towels. Tie legs together with kitchen string or a strip of cheesecloth. Place in shallow roasting pan. Brush with melted butter; sprinkle with salt and pepper. Roast uncovered for 1 hour 15 minutes to 1 hour 45 minutes until chicken is no longer pink (180 degrees internal temperature). 2. Brush chicken with half the honey and half the tarragon, and roast for an additional five minutes until honey forms a golden brown glaze. 3. Remove chicken from pan and tent with foil. Transfer pan drippings into large saucepan on stove top. Add shallots, champagne, broth, and remaining honey. Simmer, uncovered, for 10 to 15 minutes until sauce is thickened and shallots are tender. Add frozen peas and lemon slices (if using), and simmer an additional five minutes. 4. To serve, slice chicken into pieces, ladle slices with sauce, and sprinkle with remaining tarragon.